I wrote Your Presence is Here early in the morning on Easter Sunday in 2008. I remember that because my son was born a few days later, and I had a million contingency plans in place if my wife went into labor at any point during Passion week. The song is about the meaning of the resurrection of Jesus in our regular worship practices. He is risen, and he is present in every worship service. It was kind of a response to the gospel hit that was popular at the time, “The Presence of the Lord is Here.” The song as well as almost all the others on this list are included on my recording, “Guardian Grace”. Rejoice In The Lord comes from my jazz performance days in college. I was interested in what it would be like to use “Rhythm Changes” to create a song for worship. The verses were inspired by the Steely Dan tune, “Peg” The text is from Philippians 4. It’s a real harmonic work out for all you music nerds out there. I had so much fun arranging the horn parts for the pros I hired on the recording. New Creation was written after I was living in St Louis for a while. Our church had a large group of Liberian immigrants who were struggling with some pretty serious sin issues in their community that called into question their understanding of what it means to be changed by the gospel. So, I had the idea of writing a song in an African style using the text from 2 Corinthians 5:17. The bridge is composed in the typical African worship fashion where the group repeats a short idea over and over and the leader embellishes/preaches over top. Walk the Talk was the theme of the 2002 Urban Camp at New City Fellowship in Chattanooga. It was composed for that purpose and a team of African American high schoolers (including NCF-Chatt musician Nikki Ellis) helped sell it to the kids. Among the other things that were created at that camp were the “Afro Man” videos and friendship with a certain counselor that would turn into an engagement a year later. Good times. Greater Is He Who Is In Us was also composed as a song for kids in our ministries at New City Fellowship in Chattanooga. There was another song we were singing by the same title that I was really tired of, so I composed a new one. 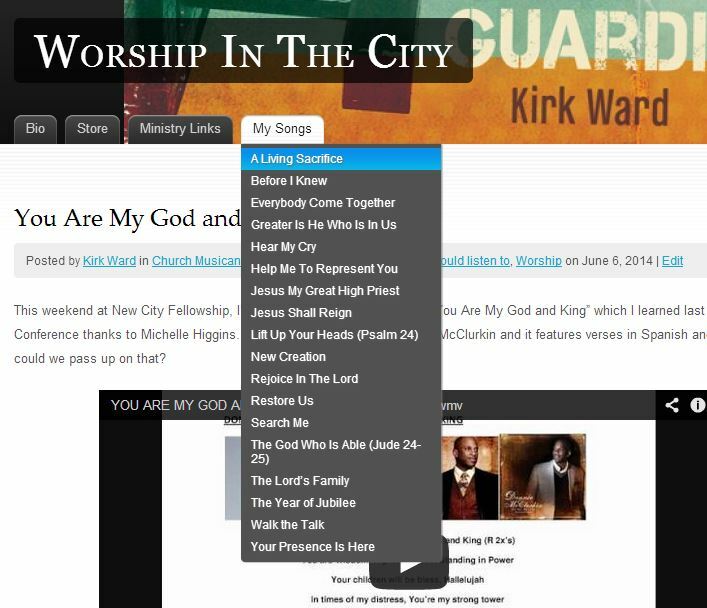 To check out all the songs that I have on ncfmusic.com you can hover over the “My Songs” tab at the top of the page.